One name that may not be familiar to many but is rising in the ranks of basketball hoops is the Goalsetter basketball hoop brand. These guys specialize in in-ground basketball hoops that are in the higher price range. 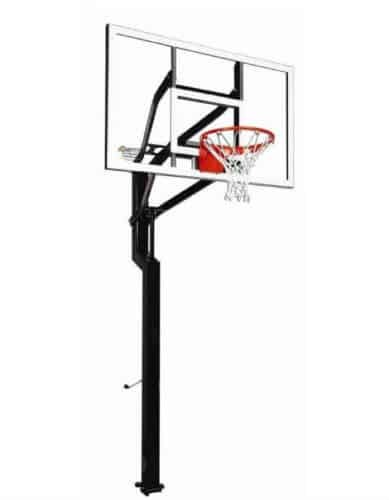 There may be no better hoop that represents what Goalsetter brings to the table than the Goalsetter All-American In-Ground Basketball Hoop. This hoop has a distinctive look and feel based on the support pole design, but make no mistake this is one of the best high end hoops you can get. Let’s start by discussing the backboard and rim. The rim for this hoop could very well be the best rim available for a recreational hoop. It is a heavy duty breakaway rim that can handle even the most monstrous of dunks. The backboard is made of tempered glass and is 60 inches wide. Acrylic backboards are available for this hoop for those who prefer durability over backboard performance. While we really like both the rim and backboard, there is a lot more to be excited about with the Goalsetter All-American Basketball Hoop. If you are looking for a great hoop and want your money to go to the right place, then you are in luck because all Goalsetter hoops are made in the USA. The support pole of the All-American is top notch with it’s one piece design keeping the unit stable. What really makes the support pole unique is the shape which allows for greater support and stability. The support pole is square shaped and 5 inches. The system also has one of the widest hoop height adjustment ranges that we’ve ever seen. The Goalsetter All-American Basketball System can be adjusted in height from 6 feet to 10 feet in infinite increments. The handle for the height adjustment can be removed to stop unwanted guests from messing with your hoop. It is also encouraging that based on the Amazon ratings this basketball system is one of the most simple hoops to install, which is not something that can be said for most recreational hoops. When real basketball players look for a hoop, they look for the best. It is easy for us to recommend the Goalsetter All-American Basketball Hoop as one of the best basketball systems that money can buy. If you are committed to your game and want to become the best basketball player possible then a high quality hoop like this one is a must. If you would like to read about some other high quality hoops, then we recommend you look into the Goalrilla GLR GS I or the Spalding Arena View.